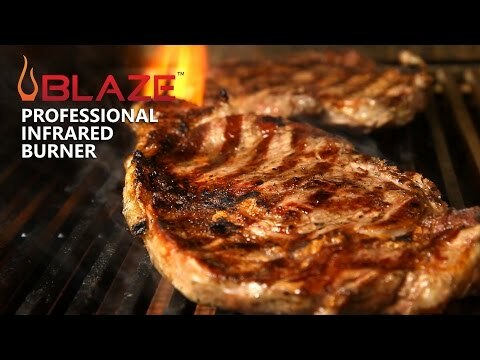 Upgrade one of the standard burners in your Blaze Professional gas grill with this infrared searing burner to take your grilling to another level. This infrared burner produces a powerful 18,000 BTUs to reach the high temperatures needed for searing steaks, pork chops, vegetables and more. The infrared burner can easily be replaced with any conventional burner on your Blaze Professional grill. Blaze infrared burners are warranted for one (1) year to the original owner against defects in manufacturing and workmanship. Grab a 2" steak, look up the reverse sear method, and enjoy something as good as you can get in a steakhouse. Easy to achieve the Maillard Reaction with this burner. Quick to swap out and doesn't need cleaning if kept red hot during use. So far happy with the product and there's not much I can break on it so should be for a long time. Can this professional series searing burner be used on the LTE grills? Can this be used inverted to sear from the top? Hi, Billy. This burner can only be used in the place of one of the standard burners as directed.